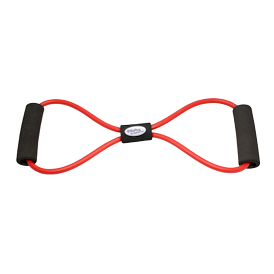 Medium resistance band keeps those muscles toned and taunt. Lightweight and perfect for home, office, or traveling. Woven emblem in 5 colors on center black connector. Emblem size: 1-1/4" x 3/4". Size: 15" x 5". Black foam handles are 4". Band colors in Red, Black, Blue, Yellow, and Green. 3 weeks after approval of artwork. Shipping weight is approximately 13 lbs. per 100 pieces.